Beta Marine Diesel Engines are manufactured in England to Lloyds of London specifications. Their engine range is built at the Gloucestershire factory in England and are based on the most advanced water-cooled diesels. 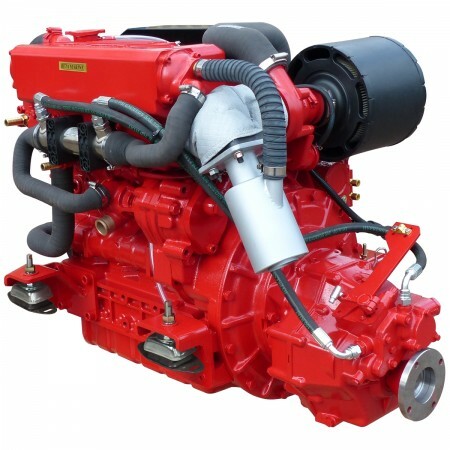 They are marinised Kubota Diesel Engines – which are widely used in tractors, bobcats and other industrial applications. The range features high quality heat exchanger or keel cooled engines which are powerful, but still manage to be compact and low weight. They have smooth running characteristics throughout the speed range. Exhaust emissions are also very low and meet all current and anticipated environmental requirements. The engineers at Beta Marine are constantly refining their engines to ensure they are (and remain) the most compact marine diesel engines on the market. Being compact also makes installation a lot easier than it would be with equivalent horsepower engines currently on the market. Beta has built a reputation for quality and customer support – their range is designed with this philosophy in mind. Even the smallest engine is heat-exchanger cooled for yacht and work boat applications. Heat-exchanged engines avoid passing seawater through the engine block – resulting in much longer engine life due to constant running temperature. All small and mid-range engines are also available in keel-cooled form to suit waterways where continuous slow speed running is required. All engines can be supplied with a very comprehensive range of options and accessories. All Beta Marine Diesel engines come with a worldwide warranty. They are reliable, well engineered, have great parts back up and are overall good value for money. Beta will also manufacture your new engine to fit your existing engine beds saving much time and money converting the beds to suit your new engine. Engine dimensions and specifications can be found on the specification page.